Anything cats can do, Buddy can do better. Well, maybe not everything, but this small Fresno, Calif., Mutt is proving he can go toe-to-toe — or, rather, paw-to-claw — with any tree-climbing kitty. Ever since he was a puppy, Buddy has been climbing the Mulberry tree in his backyard, and seamlessly jumps from branch to branch. Buddy’s owner, Gerry McWhorter, tells FOX News even she was surprised to see her canine companion scale the tall Mulberry tree in her backyard. While it certainly is unusual to see a dog climb a tree, it is not entirely unheard of; one wily Wheaton Terrier made headlines in June 2012 when firefighters had to be called to pull him from the tree he’d climbed, and another dog, a once-homeless German Shepherd mix in Michigan, was found actually living in a tree before she was rescued by the Michigan Humane Society in late December 2012. As for Buddy, well, he seems to climb his favorite tree simply for the joy in it, and McWhorter’s neighborhood seems to get a kick out of his antics — so much so that the branch-jumping pooch made the local news in his hometown. McWhorter says even when the now 5-year-old dog was only a puppy, Buddy just loved scaling the branches of that same Mulberry tree. While she initially worried Buddy might fall out of the towering Mulberry and hurt himself, it seems the talented Mutt is a natural at his hobby. After years of practice, Buddy can now seamlessly jump from branch to branch, easily keeping his balance, as he scales high into the treetop. “I was nervous about it at first but now he seems very sure-footed so I don’t worry about him,” McWhorter says of her tree-dwelling doggie, Buddy. So what lured the nimble Buddy into the Mulberry tree in the first place? McWhorter believes it has to be his sharp hunting instincts. 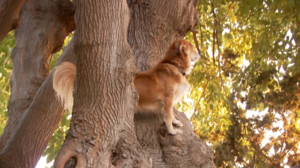 Buddy isn’t afraid to follow the birds and squirrels he hopes to catch up into the tree — even to the highest branches.